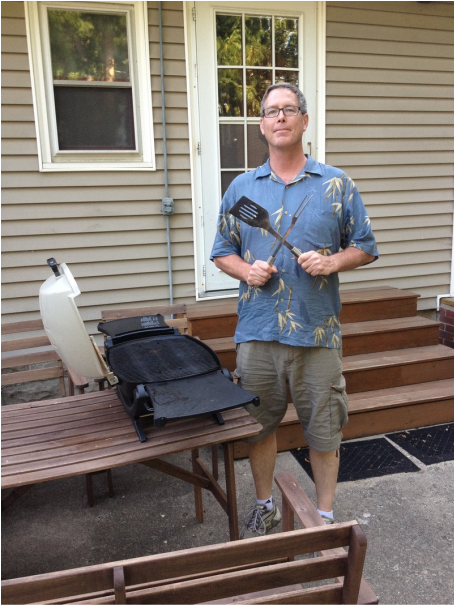 I'm Jim and I am featured Pro-Grill Non-Cook. I’m your typical Midwestern life traveler seeking adventure and enlightenment. But from 8:00 to 5:00 most days I’m an IT Director in the healthcare industry. Recent life changes have led me to the challenge of, well – learning to feed myself. I believe challenges are opportunities for growth and successful navigation of life at times requires some honest introspection. This combined with an open mind and an accepting temperament if not a thirst for new experiences has led me to some wonderful self-realizations. One of those is – I’m a non-cook! Sure, I could go on and on about how someone else always did the cooking, so it’s not my fault – but ‘fault’ seems to imply something negative. But there’s nothing wrong with being a non-cook. There is no fault. No burden. I embrace my non-cookness and I encourage all of us to let our non-cook flags fly! Me – I’m a pro-grill non-cook. I like the simplicity of throwing a slab of meat on the fire to provide one of the most basic if not the first meal ever produced. Yeah there must be something primal about it that connects with me. And no fancy marinades. I remember the first pork chop I grilled and how savory it tasted just by itself. I was so pleased that such a simple process led to such a tasty dish. My philosophy is: just throw it on the grill and when it looks done – give it a try. Earlier this year I received a gift of what seemed to me to be high-end grilling utensils. I then felt obligated to get a grill to go with my fancy burger flipper. After a little research I decided upon the Weber Q-200 portable propane grill. Once my non-cook girlfriend Shelley (Non-Cook of the Month Dec ’11) taught me the ways of the grocery I was on my way! Gosh, I sound like such a simpleton non-cook, but I guess I was. But I’m getting better. Picky Grouchy Non-Cook: What do you think is a fitting non-cook symbol? Like the kind of thing that would go on a flag. Jim Stewart: http://skreened.com/toobadtees/keep-calm-and-carry-out-light. I hope you don’t find this offensive. I don’t mean to make light of non-cookness by using an over-used meme. But I think it conveys the attitude of 'don’t worry – make it simple and just get it done'. Nothing wrong there. PGN-C: If you had to wear an apron with something written on it, what would your apron say? Jim Stewart: There are definitely some clever & interesting aprons out there – but no apron for me. I’m not an apron kind of guy. PGN-C: Well said. Where did you get your grill? Jim Stewart: Ace Hardware. I love the hardware store. PGN-C: Any advice for the up and coming non-cook? Jim Stewart: I feel I am the epitome of the up and coming non-cook. I am diving in, making mistakes, and feeling overjoyed over the smallest successes. So my advice is –simply embrace being a non-cook. Embrace it as you would any other part of yourself. And if you burn something to a crisp --- carry on and carry out.